This section focuses on the production mode, which is one of the two application modes of the IPE. The Integrated Programming Environment (IPE) application operates in two modes: Production Mode and Advanced Mode. Production Mode allows you to perform all the production programming operations. By default, the IPE is in this mode when it is launched. To make changes to the production mode, login to the log in to the Advanced Mode, then click on Production Mode option button located on the left side of the IPE window, to display the available Production Mode Settings. See the following image. The Production Mode Settings dialog enables authorized personnel to select the options that are available during production programming. For example, enabling, disabling importing or exporting HEX files. The options that are selected in the Production Mode Settings determine which menu items will be available under the File, View and Settings menus in Production Mode. 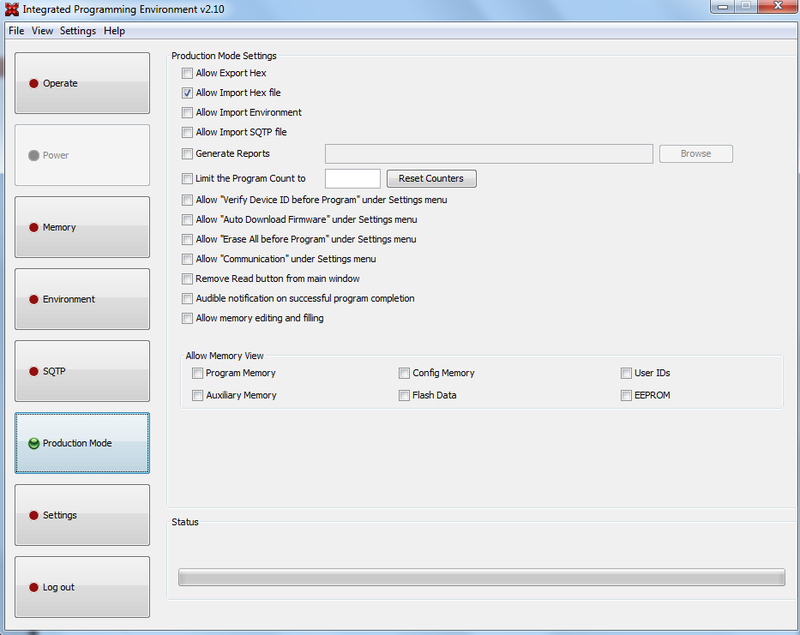 Select the appropriate settings for your production programming project by checking or unchecking the settings. Selecting a check box in the Production Mode Settings dialog causes a check mark to display in front of that option under the IPE Settings menu. A check mark indicates that an option has been set in the Advanced Mode. If the item is available and has a check mark, then the production specialist can control this item by toggling it on or off.